Chen, who also hails from China, holds a PhD in biomedical sciences with a focus on health and nutrition technology, and is proud of the restaurant’s commitment to serving healthful, fresh, MSG-free food. Her brother works at the restaurant as well. THE LOCALE Home Taste opened in early September on Mount Auburn Street, just off Watertown Square. Chen said they hope to draw upon the area’s Chinese population, but also introduce authentic Chinese dishes to diners who might be unfamiliar with them. The restaurant’s interior is fairly spare at the moment, consisting of an ordering counter and a smattering of tables. Pickup and delivery are good options. ON THE MENU Home Taste’s menu contains some of the dishes found at many Chinese restaurants in the area — sesame chicken, beef with broccoli, and the like — but diners here are well-rewarded for venturing off the beaten path and sampling the full range of regional Chinese cuisines. Traditional Chinese hand-pulled noodles, freshly made in Home Taste’s kitchen, are a spectacle well before they reach the plate. The pliable dough for the noodles is continually kneaded, then stretched like a rope and twirled, bounced and banged until it reaches the optimal consistency. The wide ribbons are then cooked in a wok filled with boiling water; the result is jagged noodles that are thick, chewy, and refreshing in their lack of uniformity. The simplest presentation is perhaps the best in this case, the noodles bathed in chili oil and showered with chili and scallions ($7.48), with stir-fried baby bok choy on the side. They also come tossed with chopped beef ($8.48), minced pork ($8.48) and sliced cumin lamb ($10.98). Chinese burgers, or rou jia mo, are a street food originating in China’s Shaanxi province dating back thousands of years — as such, they could be among the world’s oldest burgers or sandwiches, Chen said. The wheat flour bun (really more of a pocket) is baked and stuffed with meat that has been stewed for hours in a soup containing more than 20 spices. They’re incredibly savory and satisfying; at Home Taste, the fillings include stewed pork and beef, cumin lamb, hot and spicy minced chicken, and a vegetable version ($4.28 to $4.78). Mala pots, a regional Sichuan cuisine, are a real eye-catcher here. 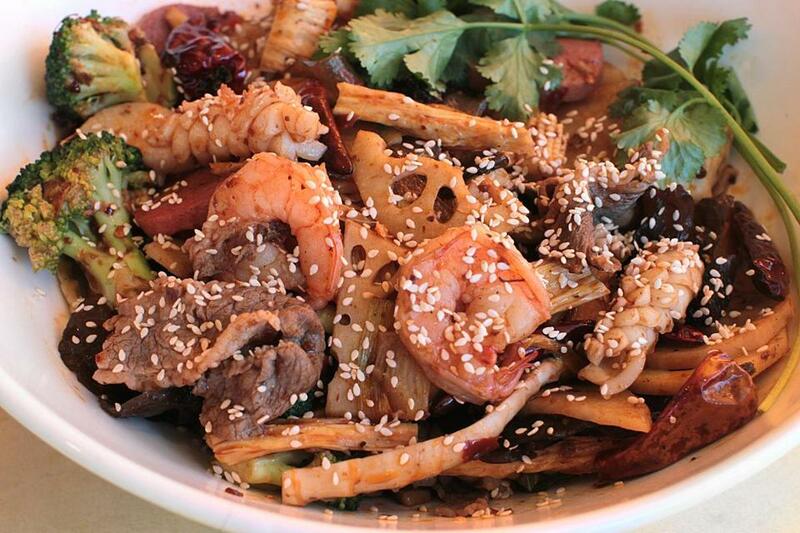 The brimming bowls are highlighted by a spicy, oily broth (“mala” means “numbingly spicy”) consisting of a mélange of ingredients: dried chili peppers, doubon bean paste, Sichuan peppercorns, cloves, garlic, star anise, black cardamom, fennel, chili powder, ginger, cinnamon, salt, and sugar. The house mala pot ($25.98, other varieties $21.98) serves up a heaping helping of shrimp, squid, chicken, and beef, and brims with exotic accoutrements, including soft tofu, fish balls, lotus root, shiitake and wood ear mushrooms, broccoli, potatoes, and green beans. They’re served with white rice, a nice foil to the pleasant burn of the oily broth. Chen also points to the Xinjiang sautéed spicy chicken ($21.98 and up), a stew served with bone-in chicken and potatoes; diners are encouraged to submerge hand-pulled noodles ($3) in the fiery sauce. For dumpling lovers, there are also handmade dumplings enveloping vegetable or pork fillings ($5.98 to $6.98). Home Taste is at 58 Mount Auburn St., Watertown; 617-923-0227, www.hometastema.com.